The Intergovernmental Panel on Climate Change’s (IPCC) new report takes stock of the most recent literature on the carbon budget. The bottom line? We’re on track to blow through it over the next decade. What is the remaining carbon budget if we’re to limit warming to 1.5°C? To have a medium chance of limiting warming to 1.5°C, the world can emit 770 gigatonnes of carbon dioxide (GtCO2). To have a likely chance (67 percent), the remaining budget drops to 570 GtCO2. Even if countries fulfill their current unconditional emissions-reduction pledges, we’re on track to blow through the entirety of the remaining carbon budget for a likely chance of limiting warming to 1.5° by 2030. 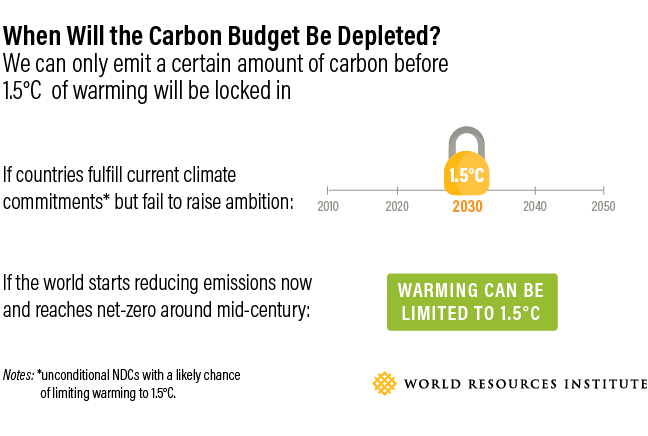 Even in the overly optimistic scenario in which current levels of carbon dioxide emissions are held constant, we would still exhaust the budget in 2030 (for a likely chance of limiting warming to 1.5°C). This clearly illustrates the need to peak global emissions before 2030 to have a better chance of avoiding the worst climate impacts. To have likely chance of keeping warming to 1.5°C over the longer term, the world will need to reach net-zero emissions within 25 years. The remaining budget is considerably higher to limit warming to 2°C: 1690 GtCO2 for a 50 percent chance, or 1320 GtCO2 for a 67 percent chance. In the overly optimistic scenario of current levels of carbon dioxide emissions being held constant, this budget would be exhausted by 2049 (for a likely chance of limiting warming to 2°C). What is the role of carbon removal in reaching 1.5°C? The report also finds that if we exceed the carbon budget, meeting the 1.5 ˚C goal will require carbon removal, a process where we’re actually taking carbon from the atmosphere and storing it. Almost all of the models used in the IPCC report rely on carbon removal to some extent. There are a number of different ways to remove carbon, such as bioenergy with carbon capture and storage (BECCS), afforestation and direct air capture and storage (DACS). Importantly, models where temperature rise exceeds 1.5˚C before dropping back down rely much more heavily on carbon removal. Deploying carbon removal at the scale that climate models assume is untested. Given the risks and uncertainties related to various carbon removal approaches, scaling would have to be pursued in a safe and prudent manner. If the speed and scale of deployment is limited, this would leave a lot of questions on how much we can rely on this strategy to meet the 1.5 degree goal, especially for those pathways that overshoot 1.5˚C. Why is the remaining carbon budget larger than estimates from the IPCC’s Fifth Assessment Report? More recent efforts have tried to incorporate the latest observations of past emissions and warming. After doing so, these estimates have looked at the difference between current warming to date compared with 1.5°C and then calculated how much more we could emit accordingly. Although the difference with the older modeling results is relatively small, given the very small budgets associated with 1.5°C, this can lead to significant differences in the calculated budget. Accordingly, the budgets associated with 1.5°C are particularly sensitive to different assumptions and uncertainties. What are the key differences and uncertainties regarding calculations of the budget? Scientists’ estimations of the remaining carbon budget vary. Key differences include the choice of model used, methodological choices, assumptions regarding historical emissions and the warming realized to date, and the extent of overshooting temperature targets, among other factors. Also, some carbon budgets are CO2-only, while others include all greenhouse gases and aerosols. Budgets that don’t take into account non-CO2 gases overestimate the carbon budget. There are many uncertainties regarding the calculation of the remaining carbon budget, including the Earth’s climate response to carbon emissions, the role of non-CO2 emissions, climate feedbacks and more. In fact, the IPCC states that uncertainties in the climate budget contribute ±400 GtCO2, and uncertainties regarding the level of historic warming contributes ±250 GtCO2 to the budget. And as a result, the timing of bringing carbon dioxide emissions down to net-zero can vary by ±15–20 years. One important uncertainty is with regard to climate feedbacks, or a cascade of impacts that can result in greater warming. For example, if the remaining budget was stretched out to 2100, it would be roughly 100 GtCO2 lower because of the potential release of methane from wetlands and thawing permafrost. We have already burned through a large portion of our carbon budget, and recently at an alarming rate. It is clear from the report that if emissions continue unabated, even with countries’ current climate commitments being fully implemented, we blow through the budget in just about a decade’s time for a likely chance of limiting warming to 1.5°C. Doing so would expose the world to even more severe heat waves, sea level rise, extreme rainfall and other climate impacts. The IPCC makes it clear that we can no longer emit at our carbon-intensive rate if we are to avoid the worst climate impacts. We must instead rapidly turn around our emissions trajectory.